Check out the other stops! 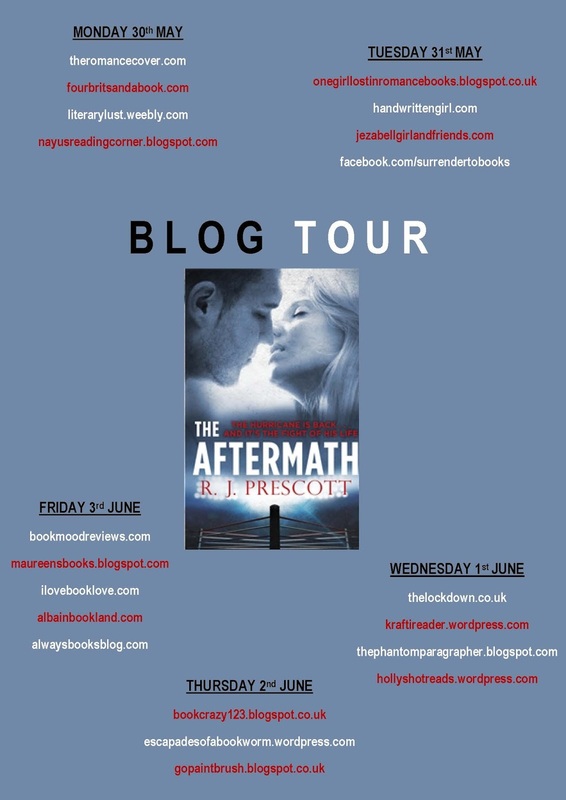 It's an honour to be one of the first stops on this blog tour! The Aftermath is a stunning sequel to The Hurricane (Link takes you to my review) despite being in O'Connell's point of view (pov) rather than my favourite character Em's. I was quite worried about the pov change as I adore female pov and can struggle with guy pov (I'm a weird reader, I like to fully relate to a character and I can't do that with guys). However, given that I adored The Hurricane and wanted to see if Em could ever be safe I knew I needed to give The Aftermath a go. I'm so glad I did! Thankfully because O'Connell is smitten with Em his world evolves around her, mostly in a good way, sometimes in a not so good way. Em is being stalked by her stepfather despite him being prison. What she endures is horrific, and I loved how O'Connell takes care of her, as do all the gym family they are both part of. It kills them all inside to see Em so distressed, I wanted her to be free but the way the story went it was doubtful. I promise the ending is fantastic. 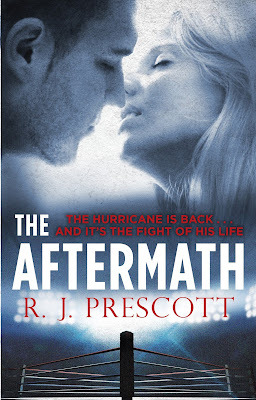 I may have peeked at the end so thought Em had gone in witness protection until I actualy got to the end, and realised the end I'd peeked at was the start of The Hurricane. >_< I only peek at end because some days I can't deal with an unhappy end, so I have to know in advance if I should stick with a book. I happily read this with only minor interruptions, so I saw how Em is her sweet self, naturally charming the important people in her life. She has spirit, don't get me wrong, but there are some things that only O'Connell and co can do to help her. I'm not a fan of boxing but I appreciate the work O'Connell puts into his training. I liked the role Father Pat plays, he is quite an amusing priest! Danny still has a huge roll in O'Connell's life, but it feels that O'Connell's friends step up a gear in this book, to try and pre-empt disaster, althogh some of it was unavoidable due to being so unpredictable. I hope there will be more of Em's story, as I love her rising through life's challenges. There is an incredible amount of swearing but it fits the characters. The blushworthy scenes were easy to skip. I would love this as an audiobook but prefer not to hear that much bad language & innuendo, so sticking with the format which has pages! Do go read this series, you won't regret it! Find out more on R. J's website.